Facebook will be releasing a Cocoa framework for the iPhone that will allow application developers to integrate with Facebook Connect. Facebook Connect allows applications / appls to integrate the facebook platform and the identity of users into their own applications. Initially Facebook Connect is only available for web applications . After some times this application / appls will available for both mobile and desktop platforms. WordPress for iPhone just launched on the App Store . WordPress claims it first Open Source app that lets you write posts, upload photos, and edit your WordPress blog from your iPhone or iPod Touch. washingtonpost.com also launches First iPhone Native Application. washingtonpost.com launches the site’s first downloadable application ( City Guide ) for the iPhone and iPod touch, providing an on-the-go, personal entertainment guide for over 2,000 Washington. * Users can quickly look up an address, phone number, hours, price range, directions and more. Are you going to launch any down loadable application for the iPhone and iPod touch ? * Rotary Dialer (free): Brings a touch of old-school glamour to the cutting-edge iPhone. Use the virtual rotary-style dialler instead of the numeric keypad to make calls. * Twitterific (free): A must for Twitter addicts, this simple but beautifully-rendered application provides a rich user experience and elegant layout. * Starmap Planetarium (£6.99): Astronomers and space nuts will love this – a stargazing guide that provides information about constellations, planets and even shooting stars, plus oodles of scientific details. * Lonely Planet Mandarin Phrasebook (free): With the Olympics just weeks away, now is the ideal time to get to grips with the Chinese language. This audio phrasebook provides a phonetic guide to Mandarin. You’ll be debating the gold medal chances of the Chinese gymnastics squad with a noodle street vendor in no time. * Remote (free): Turns your iPhone or iPod touch into a remote control for your Mac or Apple TV. It works with your wi-fi network so you can control playback and shuffle tracks from anywhere in your home. * PhoneSaber (free): Utterly pointless, but thoroughly cool, this app turns your iPhone into a light saber, complete with sound effects. * UrbanSpoon (free): Can’t decide where to eat? Shake your iPhone to pick a good restaurant. You can use GPS to find nearby eateries, or filter results by cuisine or price. Covers most US cities, as well as London. * Etch-a-Sketch (£2.99): Twiddle the virtual dials to start a sketch, or draw directly on screen using your finger. “Tilt technology” will be added soon to enable you to move the iPhone itself to create a drawing. * Meal Splitter (£4.99): There will be no need to squabble over restaurant bills with this application, which precisely calculates what each diner owes based on the cost of the meal. Okay, so the iPhone’s in-built calculator could do pretty much the same thing, but this takes the pain out of the entire process; it will even work out how much the non-drinkers should pay compared to the drinkers. * Vicinity (£1.79): Takes advantage of the iPhone 3G’s GPS to provide one-tap access to information about local services and amenities. It will even pull in relevant Wikipedia entries and Flickr photos. * Band (£5.99): Compose your own music using the collection of virtual instruments. * Where? (free): A location-based application that will recommend the best restaurants, the nearest Starbucks, and even the location of friends in your network. * Exposure (free): A quick and easy way to access your Flickr photo stream, as well as all your photosets, tags and contacts. An advertising-free version is available for £5.99. * TypePad (free): If you’ve got a TypePad blog, download this application to instantly update your blog from your iPhone. * Currency (free): This currency converter provides up-to-the-minute exchange rate information for over 50 currencies and 70 countries. * Stage Hand (£4.99): Control your Apple Keynote presentations using your iPhone or iPod touch, and read and review slides on its screen. * WeatherBug (free): Keep track of live, local weather information in up to three cities. Includes satellite maps and radar forecasts as well as severe weather alerts. * Facebook (free): The simple interface allows you to chat with friends using Facebook messenger, post pictures to your profile, and check on your friends’ status updates. 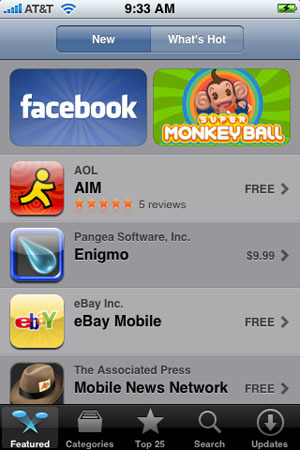 * Super Monkey Ball (£5.99): The pick of the bunch of new games for the iPhone and iPod touch. Tilt the device itself to control the progress of a monkey inside a transparent bubble. The graphics are first-rate, and the gameplay is highly addictive.